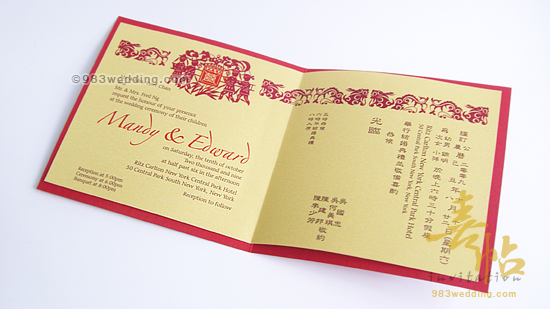 This is a wedding invitation with red color as the main color theme. 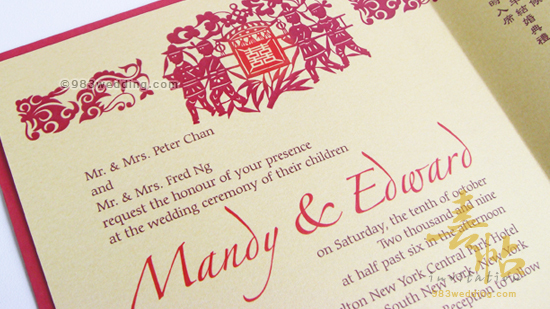 For the cover design, the colorful Chinese paper cutting pattern with a pair of lovely celebrates the union of the couple. This is in fact one of our best selling wedding invitation design. 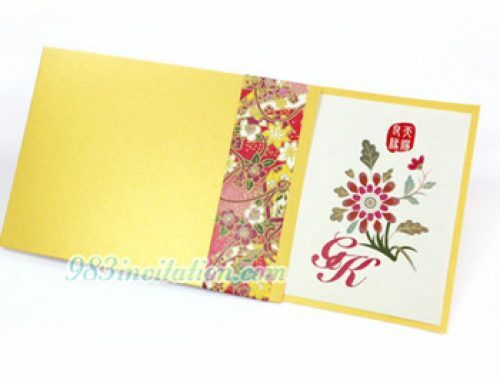 There are brides and grooms who love to have a modern Chinese wedding card design. There are a lot of treatments we can consider when creating such a design. Although couples want to have a modern design, a lot of us would like to stick to the idea of having a red color scheme. So, we decide to choose red as the main color theme of the card. A piece of gold color strip is put on the red color cover. The patterns printed on the strip is very colorful. The patterns are paper cutting designs. There is a paper cutting double happiness symbol in red. 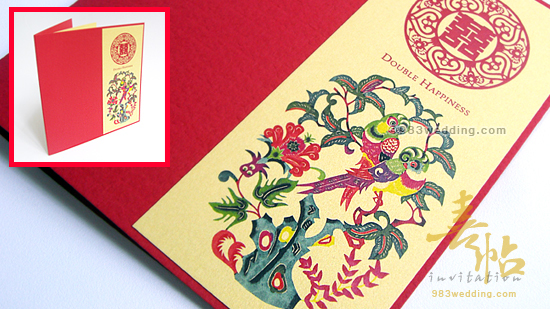 There is also another colorful paper cutting design with two lovely birds beneath the double happiness symbol. All these patterns and symbols are meant to be celebrating the wedding of the couple. 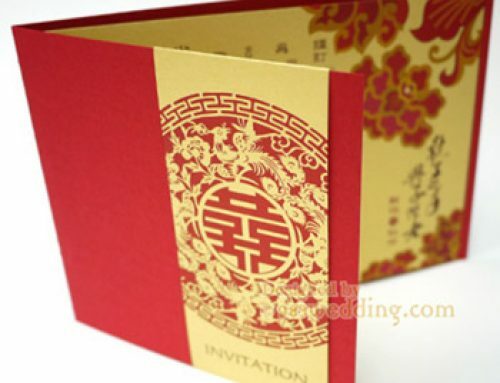 The colorful patterns, with the main red color theme, deliver a modern quality to this Chinese wedding invitation card. Now, let us talk about the design of the insert. It is also gold in color. The weight of the paper is 120gsm. A beautiful pattern is printed as a border on the top of the insert. 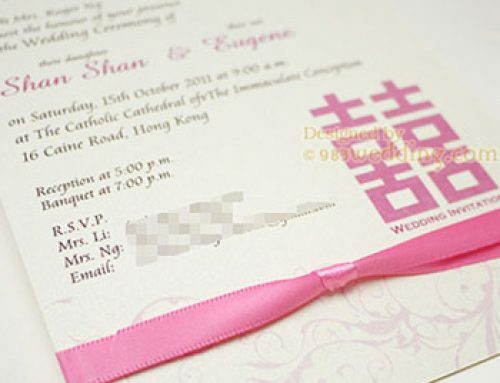 In fact, wedding invitation inserts are something important in order to make the design beautiful. There are some simple phoenix patterns. The border in fact features a team of people who are going home with the bride (denoted by the double happiness symbol). 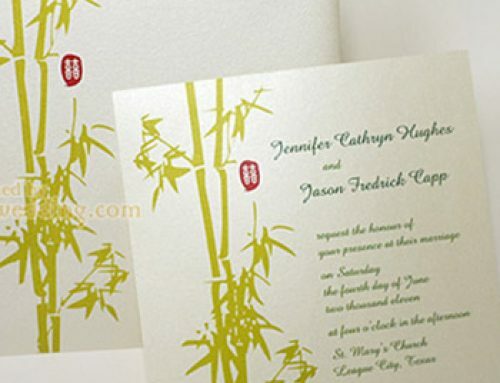 In fact, this signifies that the bride is going to the home of the groom (for a traditional Chinese wedding celebration / ceremony) and they will get married. All the colors used are brown and red colors. This reminds us of the idea of Chinese wedding tradition. And it echoes with the whole design of the invitation! 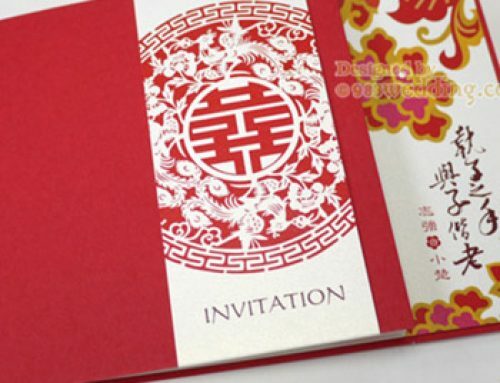 Besides this invitation, you can also take a look at another design “Red Double Happiness With Dancing Birds“, which is a variation of this design. It is also a unique and exquisite wedding card. 210gsm red color paper mounted on 250gsm gold color paper with the insert in full-color printing on ONE side.